The town of Hamden lies between two trap rock formations that constitute its northern and southern borders. While East Rock is well-known to local residents as the towering hills viewable to the south, Hamden’s most famous geological landmark lies to its north. 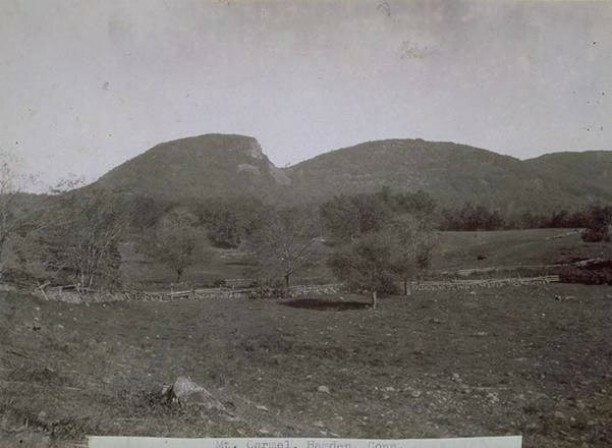 The unique ridge that runs east-west just six miles north of New Haven is known as “Sleeping Giant” for its resemblance (from a distance) to a recumbent person. Geologists estimate that the trap rock ridges in Connecticut formed from volcanic eruptions more than 170 million years ago. Sleeping Giant received its name thanks to local Native American creation stories, which are part of a complex belief system about the beginnings of the cosmos and human beings. The giant rock formation embodied Hobbomock, an evil spirit who became angry at the neglect of his people. In his rage, Hobbomock stamped his foot near the current location of Middletown, which caused the course of the Connecticut River to change. A good spirit named Keihtan is said to have cast a spell on Hobbomock that caused him to sleep forever, preventing any further damage to the area. During the mid-1800s, as New Englanders took to the mountains searching for a respite from the era of industrialization, many cottages appeared on the ridges of Sleeping Giant. Judge Willis Cook built one of these cottages on a part of the ridge known as the giant’s “head.” By 1911, however, vandals had become such a problem that Cook decided to lease the land to the Mount Carmel Traprock Company for quarrying. Local residents objected to the continuous blasting and the damage that quarrying did to the area. In 1924, they formed the Sleeping Giant Park Association in order to acquire, preserve, and maintain the land around Sleeping Giant. The organization raised tens of thousands of dollars and eventually bought the rights to land, ending quarrying there by 1933. In subsequent decades, the Association managed to halt plans for an oil pipeline across Sleeping Giant and defeated proposals for the installment of nearby television and telephone antennas. Today, Sleeping Giant State Park affords visitors in an otherwise urban area a natural refuge that offers miles of hiking trails and spectacular views of Long Island Sound and the New Haven area. “A Brief History of the Sleeping Giant.” The Sleeping Giant Park Association, 2016. Link. “Sleeping Giant State Park.” Department of Energy & Environmental Protection, 2016. Link. Lehman, Eric. Hamden: Tales from the Sleeping Giant. Charleston, SC: History Press, 2010.